No matter what system you use for your games, being a game master is a perilous pastime. As soon as the players arrive with their PCs at the ready, your well-formulated plans can go off-the-rails at a moment's notice. If you have somewhere to put the PCs for a bit while you ponder your options, it can smooth things out considerably. If you're in need of such a location on short notice, One Spot is for you! Each product in the line focuses on a different location you can easily drop into any fantasy town or city. Instantly you have a place with NPCs, descriptive text, plot hooks, and more to give you the tools you need to quickly populate a place your PCs can interact with. One Spot #1 presents a tavern called The Painted Man, complete with a barkeep (the artistically decorated Painted Man), tavern map, images, and more. 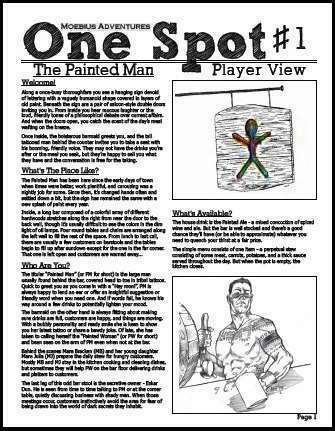 One Spot #1: The Painted Man is another great tool to include in your bag of GM tricks! An introduction, location description, tavern map, and image of the tavern sign. A bit of background on the Painted Man himself, his mannerisms, and a picture. Descriptions for the other NPCs involved in operating the tavern, from the bubbly barmaid to the secretive owner. A suggestion of what items might currently be on the menu and on tap. A list (10 items) of potential facts and rumors to kick things off. A list of hooks (4 tables of hints) for how one or more of the PCs may have interacted with the tavern before. This is the second in a new series of short (2 page), system-neutral supplements from Moebius Adventures designed to provide easy locations to drop into your fantasy campaign, complete with hooks, NPCs, and a few surprises. Player-ready information, including: a location description providing details on what and who to expect, along with an image or two to help set the scene. GM-ready information, including: NPC details, location map, encounter/hook ideas, and a random table to help determine any prior relationship with the place a PC may have. Each location can then be used independently or together to help you fill a temporary gap or add details to your worlds without a ton of work. Pick a spot, drop it in, and roll!